The Power To Light Up A Room. Everyone is happier when serving a purpose – humans and dogs alike. In each issue of The New Barker dog magazine, we feature working dogs, which can be any form of work, as determined by the dog-human team. Here is an excerpt from our winter issue, featuring a group of volunteers for the Pinellas Chapter of Therapy Dogs International. It takes a special kind of dog to be a pet therapy dog. It takes an even more special kind of human being to recognize that their dog might be able to provide a service for the betterment of mankind. We were recently introduced to a group of volunteers for the Pinellas Chapter of Therapy Dogs International (TDI) by Elliott Rakofsky, Vice President of Development at PARC. Elliott and his dog, Conrad are TDI volunteers. PARC provides over 40 services to more than 800 children and adults with developmental disabilities in Pinellas County. It was founded in 1953 by Edythe Ibold and a group of parents with children who had developmental disabilities. Several years earlier, Edythe’s daughter Midge had been born with Down’s syndrome. When Midge was still a toddler, Edythe decided to telephone the Pinellas Superintended of Schools to find out what the training options were for her daughter. She was shocked to learn that the School Board was prevented by law from providing education and training for developmentally-challenged children. Those words impelled Edythe into action and she set out from that day forward to change the system. 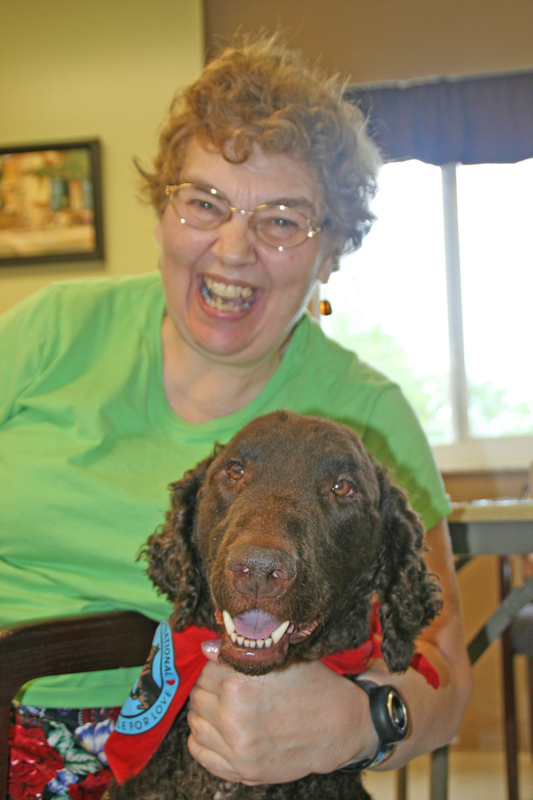 Leilah, a Curly Coated Retriever, interacts with a Curry Villa resident. The first project was the opening of a pilot class for children with developmental disabilities in 1953. The School Board furnished the teacher, the Red Cross provided transportation and members of the Junior Women’s Club provided volunteer assistance. Today, PARC has a national reputation as a progressive leader in the field of developmental disabilities. Expansion in recent years has brought enhanced innovative opportunities for PARC clients. PARC maintains four residences for both adults and children with developmental disabilities. The residents served by these homes range in age and abilities. TDI team Alex and April interact witha PARC/Curry Villa resident. April adopted Alex, a Border Collie/Jack Russell Terrier mix, from the SPCA Orlando. The New Barker was at Curry Villa on the day that Therapy Dogs International volunteer teams were scheduled to visit its residents. Through the lens of my camera, I couldn’t tell who was happier to be in the room: the dogs, the residents or the TDI volunteers. Everyone was either smiling or laughing. The dogs were smiling too, tails wagging uncontrollably from all the extra attention. Who was benefiting more from the interaction? It was a tossup. As I photographed one resident with a dog, another one tapped me on the shoulder and asked if he could have his picture taken. The more photographs we set up, the more residents wanted to be photographed with the different dogs. The dogs utilized for therapy work vary in size and breed. Many are mixed breeds. The one thing they all have in common is a love for human interaction. Alex, a nine-year-old Border Collie/Jack Russell Terrier mix was adopted by April from the SPCA Orlando. He was either lost or abandoned during Hurricane Charley. April was so grateful to have found Alex, she decided that giving back to her community felt like the right thing to do. “Like paying it forward,” she said. They have been a TDI team for almost six years. 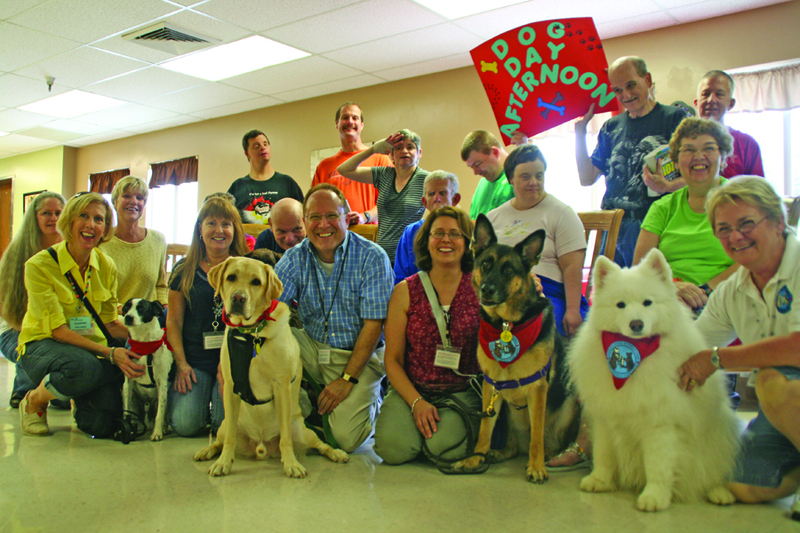 Volunteers for the Pinellas Chapter of Therapy Dogs International, visiting residents of PARC’s Curry Villa. 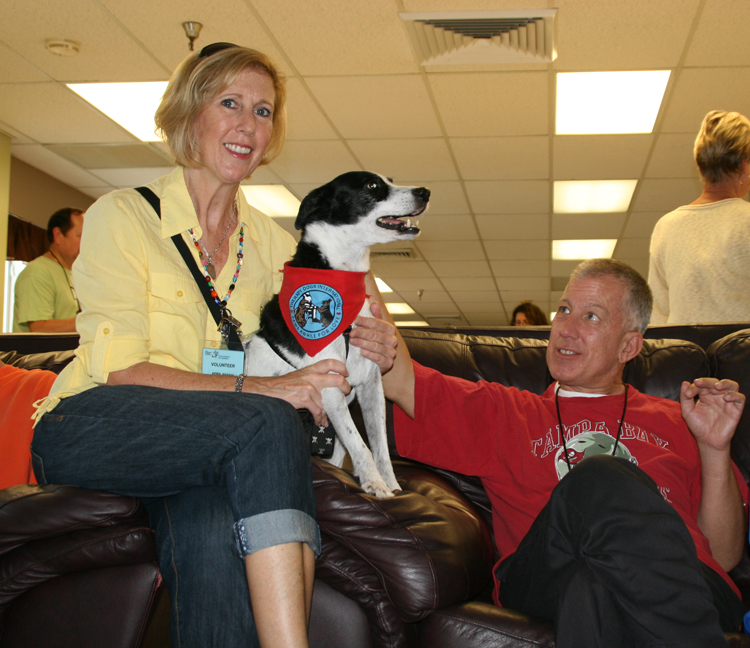 Many of the volunteers visit several different facilities that use therapy dogs to interact with their patients and clients. Candace Coughlin and her Samoyed, Crystal participate in the Tail Waggin Tutors program. They visit the VA Hospital at Bay Pines in St. Petersburg, in addition to their volunteer work with PARC. She agrees with April on the theory of paying it forward. Candace and her husband Paul have built a successful business in the Bay Area that revolves around dogs. For more than 25 years they’ve been dog trainers, and Candace has been a pet sitter for almost six years. It has been a rewarding journey for the Coughlins. “I love my dogs and enjoy being with people who feel the same. I cannot imagine my life without dogs,” said Candace. While it is clear that the dogs’ owner/handlers have an unselfish desire to help others, they all admit to receiving something in return for their time and effort. “It is so rewarding to watch Leilah interact with the residents, and to see the joy she brings to them,” said TDI volunteer Toni Lynn Sharpe of her four-year-old Curly Coated Retriever. For information on Therapy Dogs International, Pinellas County Chapter, contact April at 727.771.5995 or email her at TDIChapter256@gmail.com. To learn more about PARC visit http://www.PARC-FL.org. Later this week, read about another Working Dog featured in The New Barker. Molly, a little Shih Tzu with a very big heart. Previous Previous post: Michael Phelps’ Dogs Pose with Super Bowl Trophy? Next Next post: Dog Lovers Around the World Agree: That’s One for Pope Francis.